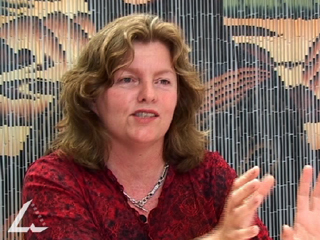 Video clip synopsis – Christina Spurgeon talks about crossing the digital divide. Broadband MP4 digital_bb.mp4 (5.0MB), suitable for iPods and computer downloads. This interview with Christina Spurgeon was recorded for the website From Wireless to Web, produced in 2005. This area of study focuses on Australian, overseas and/or global issues and/or developments in the media industry and their impact on media production stages and specialist roles within these stages. Media products are the result of collaborative and specialist production stages and roles. The degree of specialisation among production personnel may vary according to the production context. Digital television broadcasting provides higher quality viewing and more television services by using the same digital technology used in computers, compact discs and mobile phones. Digital TV delivers clearer, sharper pictures with less interference and ghosting, which currently affects many viewers in built-up or hilly areas. The change from analog to digital television will also give viewers more choice with multi-channel programming, and viewers will receive broadcasts with cinema quality images and surround sound. Digital TV will also let viewers receive 'enhanced television services’ – services like subtitles, captioning, datacasting and a choice of viewing angles, plus internet features like email, web-browsing and access to online services – all via their television set. The difference between analog (traditional) and digital television lies in the way the information is carried from the source (the transmitter) to the receiver (the television). With analog broadcasting the signal is in the form of a continuous wave, whereas digital is in the form of discrete bits of information. The commercial and national broadcasters began digital television transmission on 1 January 2001 in the metropolitan markets – Sydney, Melbourne, Brisbane, Adelaide and Perth – and services to regional areas are progressively rolling out. During the eight-year conversion to digital TV, broadcasters are required to transmit (simulcast) both analog and digital signals. Australia’s full conversion from analog to digital television will be complete in 2008. To receive digital TV, viewers need either a digital television set that can process and display the full digital signal, or a digital set-top box that can convert the broadcast to an analog signal for reception by a traditional analog television set. List all the things you can think of that you need digital technology to access (or that having digital technology makes access much easier). An example of this may be using a credit card and the web or phone to book concert tickets. Do you think there is a digital divide in Australia? What about in the world? What might be some consequences of this? Do you think that it is important that everyone has access to digital technology? How can we ensure that people can access it?